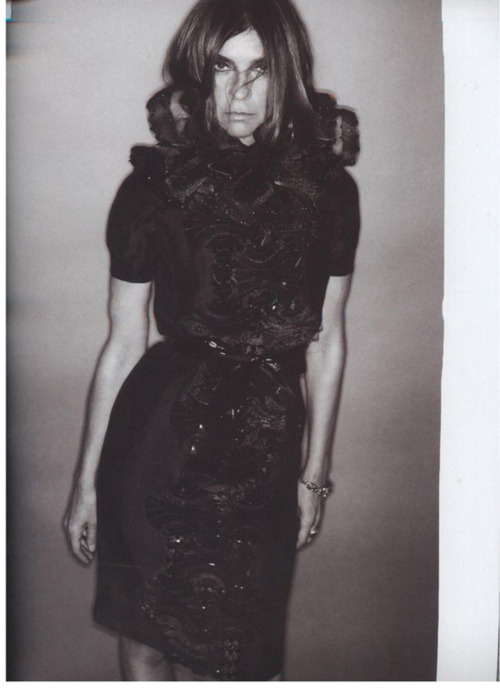 Carine Roitfeld is giving up her crown as editor-in-chief of Parisian Vogue today, after reigning the magazine for ten years. The 56-year-old has become a style icon in her own right, appearing front row, and having the final say on many a designers fashion show. Whereas Anna Wintour’s ‘bobbed hair, print dress and sunglasses’ style remains the same, I like how Roitfeld has a daring, feisty and ever-changing style. Firstly, Roitfeld began modelling at 18, after turning to writing and styling for French Elle. In 1990, she began working with Mario Testino doing shoots for Vogue US and Vogue Paris. Up till 1996, she was both consultant and muse to Gucci and Yves Saint Laurent, before becoming editor of French Vogue in 2001. Roitfeld announced she’d be resigning from the magazine and will leave in January 2011, proclaiming “I think it’s time to do something different”.